Hi everyone! Here's another Mario related project of mine...actually I just noticed that the only projects I've posted here are Mario inspired! I saw a project similar to this one on Ravelry and just had to have a go at it. 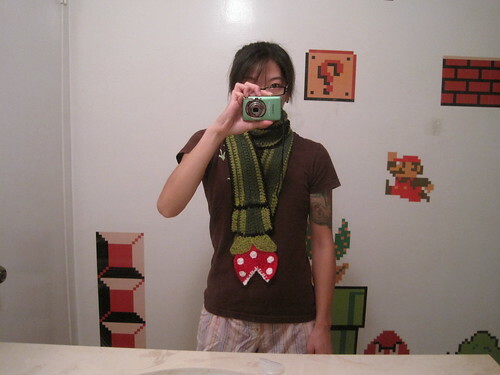 This is a Piranha Plant scarf that I made for my bf's younger sister. She's either a Junior or Senior in high school. Our apartment kind of has a Mario theme going on...even the bathroom's decorated! I used Lion Brand Jiffy Solids. 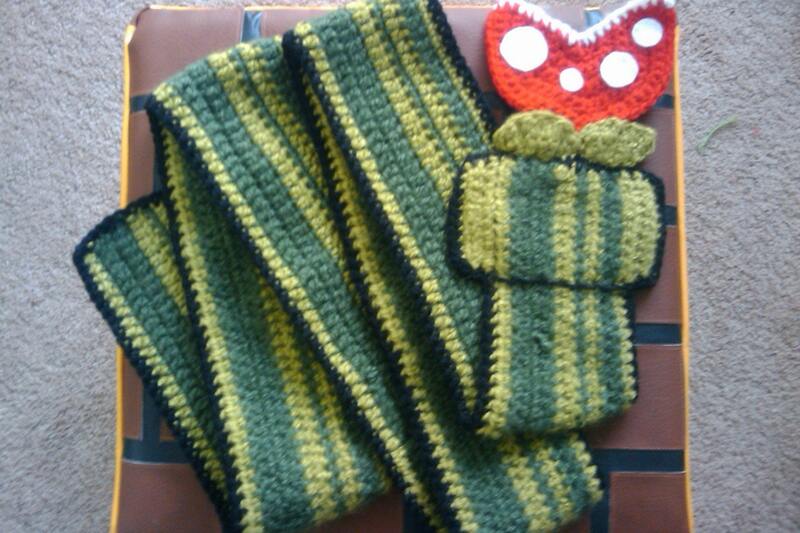 Originally I doubled up on the yarn when I made the green pipe, but it came out too thick and stiff. So I started a 2nd green pipe without doubling up and it turned out soft and cozy. Here is the pattern for the Piranha Plant itself for those who want to have a go at this. 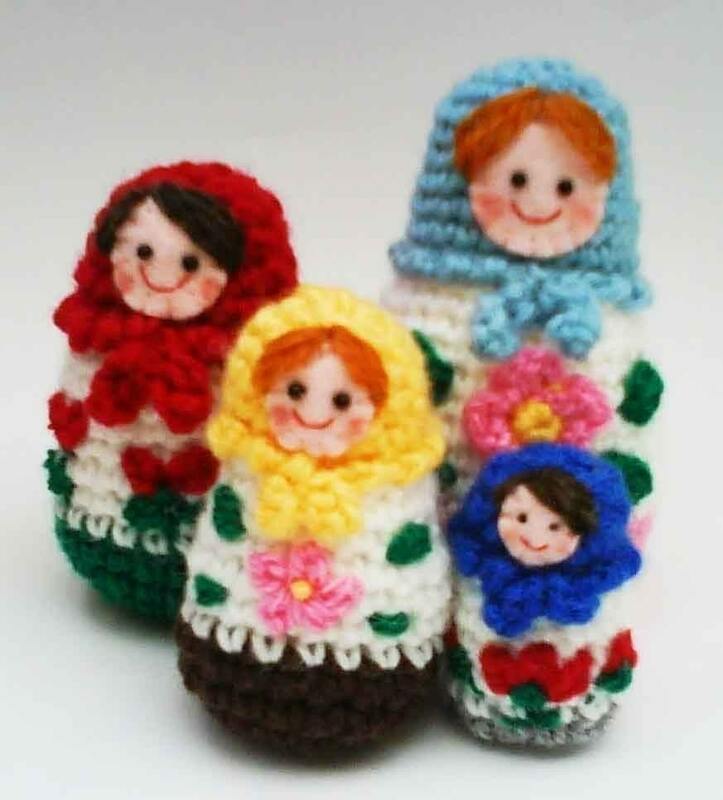 Please do not resell the pattern or the finished product, thank you! More geeky gaming related projects! This is awesome! You did a great job!!! I think anyone would be crazy not to love it! AWESOME!!! I would love to see more!!! The bricks with mushrooms or coins would be cool!! geek's always been chic for me XD and i would so wear that out. it's fantastic! I like the scarf. I like your place too. Mario has been the only game I have picked up and I loved. Is the plant's head crocheted seperate and then attached to the pipe? good job!! I just had to comment becasue this is super clever! And guess what? I'm also going to hit the this rocks button becasue it does! That's pretty cool. I would be honored to wear it. Is the plant's head crocheted seperate and then attached to the pipe? good job! !